After World War II the bottom fish market began to grow. 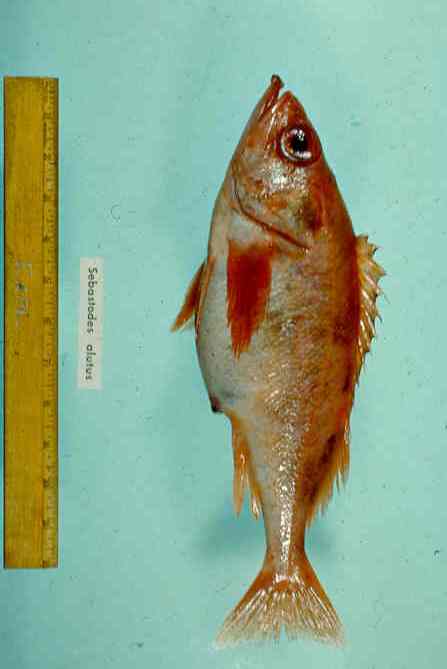 Petrale sole made up a large percentage of the landings and the catch of rockfish, specifically Pacific Ocean perch (POP), began to increase with the advancement of refrigeration. This enabled the fish houses to expand the market of POP with Army contracts as well as with buyers on the east coast. There was fierce competition with a similar Atlantic Ocean species called Ocean perch with the decline of the Great Lake’s yellow perch fishery. 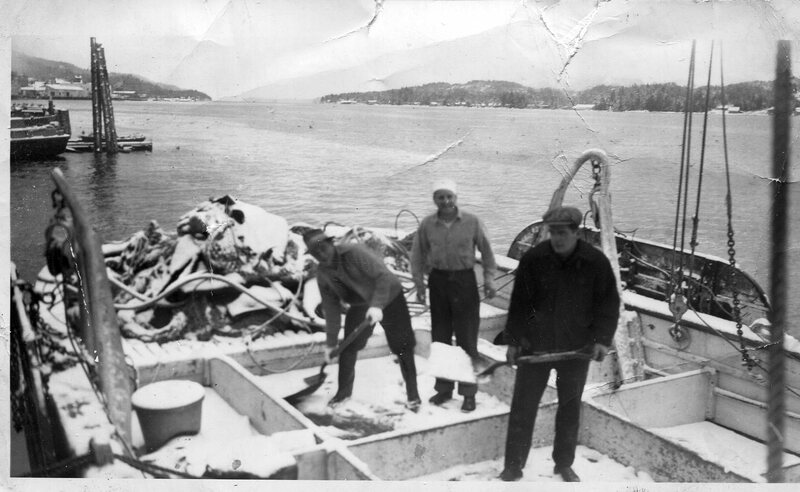 Demand for POP grew and Dan Luketa started catching it in the international waters of Canada north of Vancouver Island in Queen Charlotte Sound and Hecate Straits. 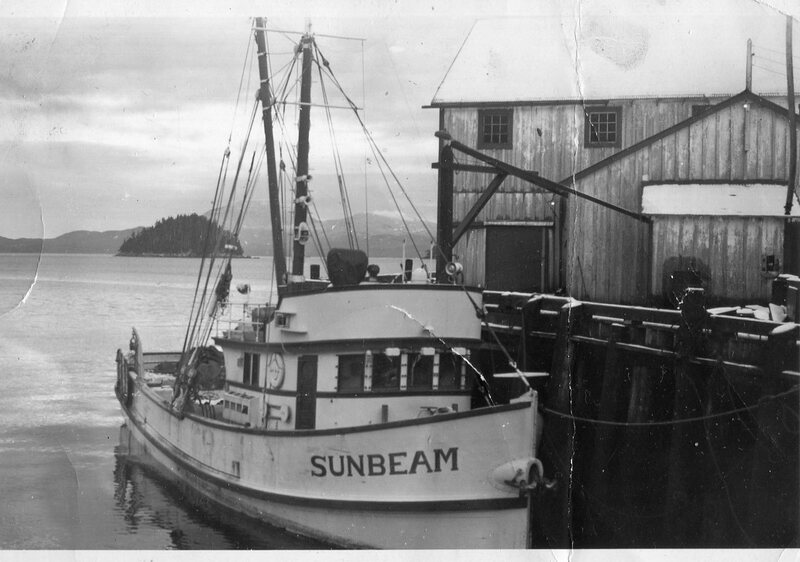 He purchased Western Flyer in 1952, converted her to a trawler and added her to his two other converted trawlers, Sunbeam and Paul L, to harvest POP. Kevin Bailey’s book gives the reader insight into Dan’s business. It made economic sense to travel the inside passage to the extremely productive fishing grounds off Canada, especially during the winter months when the demand for fish was high, without having to worry about crossing the Oregon and Washington bars. 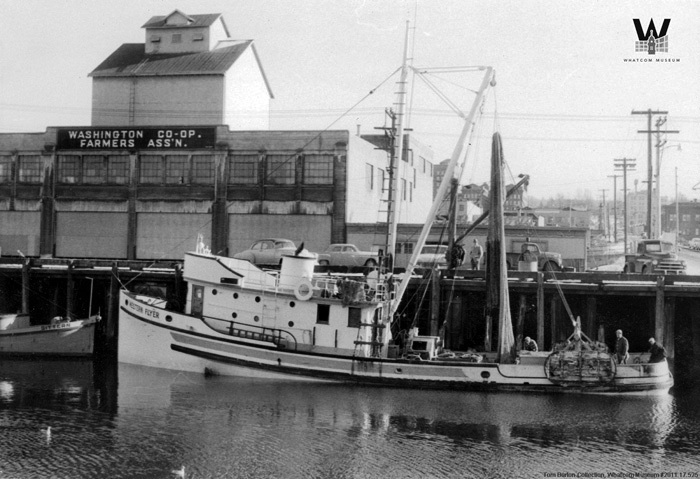 His book has two pictures of the Western Flyer as a trawler, one of which was found in the Whatcom Museum photo archives and is the earliest, waiting with a load of bottom fish to be off-loaded in Bellingham, Washington. The Luketa family were innovators and the trawl doors shown in the picture are different from the doors on the Cobb , which were wooden and of the same design as those used by the rest of trawl fleets throughout the world. The second picture was taken later when she was chartered by the Halibut Commission in 1962, after she had been fitted out with a net reel and V-doors on the stern, also Luketa innovations. 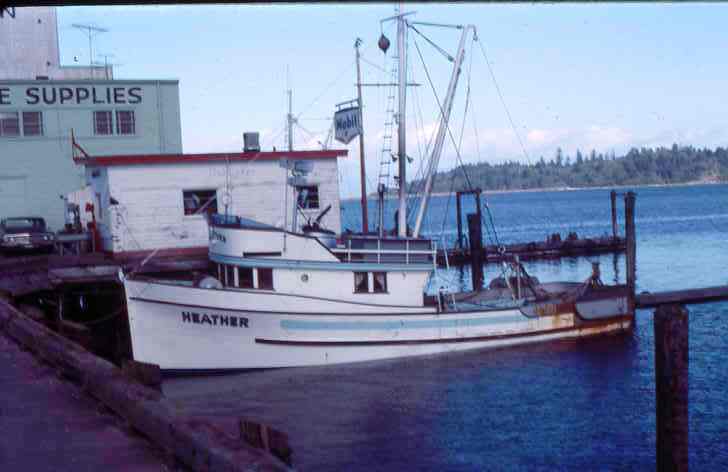 Western Flyer is a typical Pacific coast seiner, which is referred to as a combination vessel. When Luketa purchased her after the collapse of the sardine fishery, he converted her into a trawler by removing the turntable, seine davit, seine winch and the crow’s nest at the top of the mast, which was used in sardine fisheries to spot sardine schools. He added a metal railing around the stern where the turn table had been, along with two trawl stanchions and a centralized trawl winch similar to the Cobb’s. I miss talking with Tom Dunatov. With his passing we’ve lost a fantastic resource about the fishing industry and the Croatian community. Tom talked about Luketa’s trawl fleet of three vessels: the Sunbeam, Western Flyer and the Paul L. His dad worked on the Sunbeam before being employed on the Cobb. We also discussed their innovations, the flat doors that developed into V-doors and are often referred to as the “Luketa doors.” V-doors became common in Pacific coast trawl fisheries, and while I was working on the Cobb in Neah Bay during the ‘60’s I took a picture of the trawler Heather, with its set of V-doors. They are also credited with the introduction of the trawl net reel. 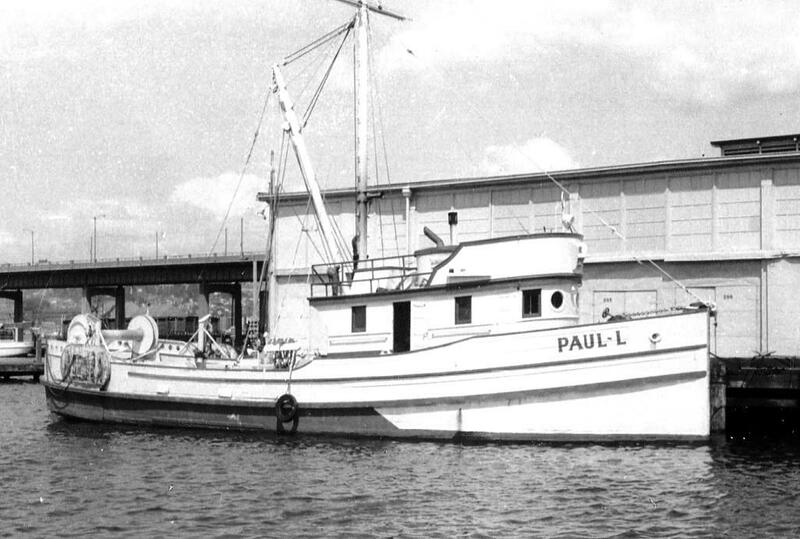 Brad Pattie, whom I accompanied when we flew over the Soviet Fleet in 1967, had a few pictures of the Paul L with her new trawl reel on the stern. The date on the photographs was August, 1957, two years after the net reel was introduced to the trawl fleet. 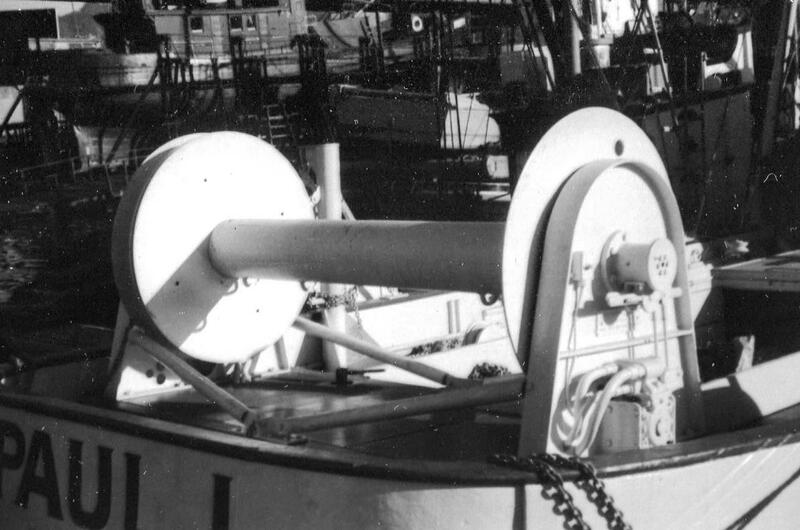 In 1959 (1) Lee Alverson published a picture of the Sunbeam with a new trawl reel that appears to be like that on the Paul L. The net reel was a great asset to trawling in the North Pacific when it was introduced – it improved setting and hauling of the trawl by rolling up the bridles along with the net itself. I visited the Western Flyer in Port Townsend where she was being reconstructed during the 2015 Wooden Boat Festival and found a couple of modifications to the skipper’s quarters that I had missed when I drew her as a seiner. The first was adding a sliding door. The second appeared to be removal of the top bunk and adding a chart storage cabinet in the wall where the bunk had been, along with a drop-down chart table. I believe that these changes probably occurred when she was converted to a trawler, because the crew size of a trawler is smaller than required by a sardine seiner and navigation had to be more precise in making and locating drags along trawlable grounds. I also noticed where the break occurred between the fish hold and the engineroom. 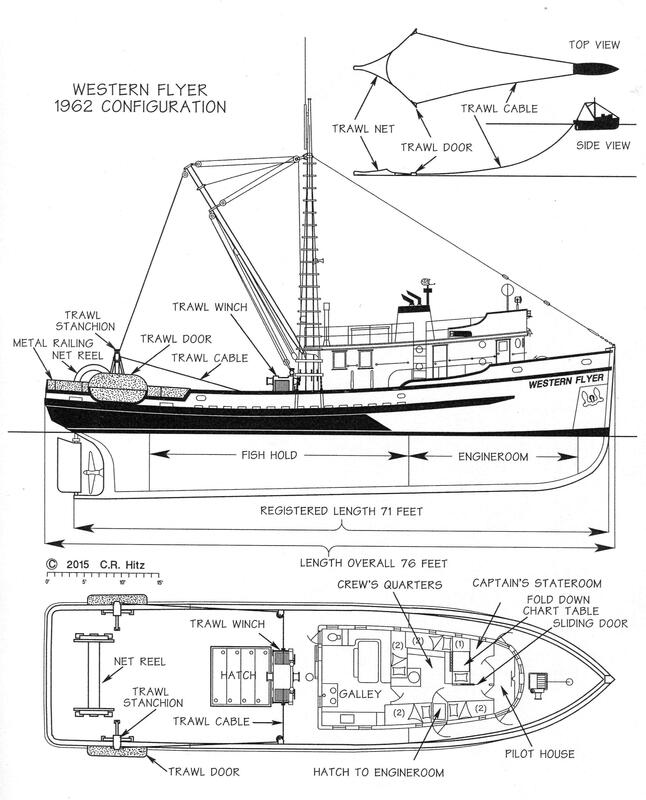 I added the changes to the drawing as she appeared in 1962 as a trawler, which included the net reel and the V-doors, when she was charted by the Halibut commission. Bailey’s book stated that “When the Pacific ocean perch harvest started falling in the 1960s, Dan Luketa realized that he needed a new fishery to support his flotilla. He and the Western Flyer headed north once again, this time to the Aleutian Islands to fish for red king crab in the stormy waters of Alaska”. So when the Soviet Fleet appeared off the Washington and Oregon Coast in 1966 and began fishing in as close as 3 miles off the coast, the Western Flyer had already gone on a new adventure, described in Keith Bailey’s book. This entry was posted in boat building, Carmel Finley, Cold War, Environmental History, fisheries science, Fishing, History of Science, History of Technology and tagged Bering Sea, Bob Hitz, Dan Luketa, Dayton Lee Alverson, Donald Gunderson, Ed Ricketts, F/V Paul L, F/V Sunbeam, fisheries history, Fisheries Science, Fishing, George Yost Harry III, Kevin Bailey, Western Flyer. Bookmark the permalink. A very interesting article, Carmel. I enjoyed reading it and learning!